The Battle of Cowpens (January 17, 1781) was a decisive victory by American Revolutionary forces under Brigadier General Daniel Morgan, in the Southern campaign of the American Revolutionary War. It was a turning point in the reconquest of South Carolina from the British. (About) Battle of Cowpens 17 January 1781. Right flank (cavalry) of Lt. Col. William Washington and (left flank) the militia returned to enfilade. 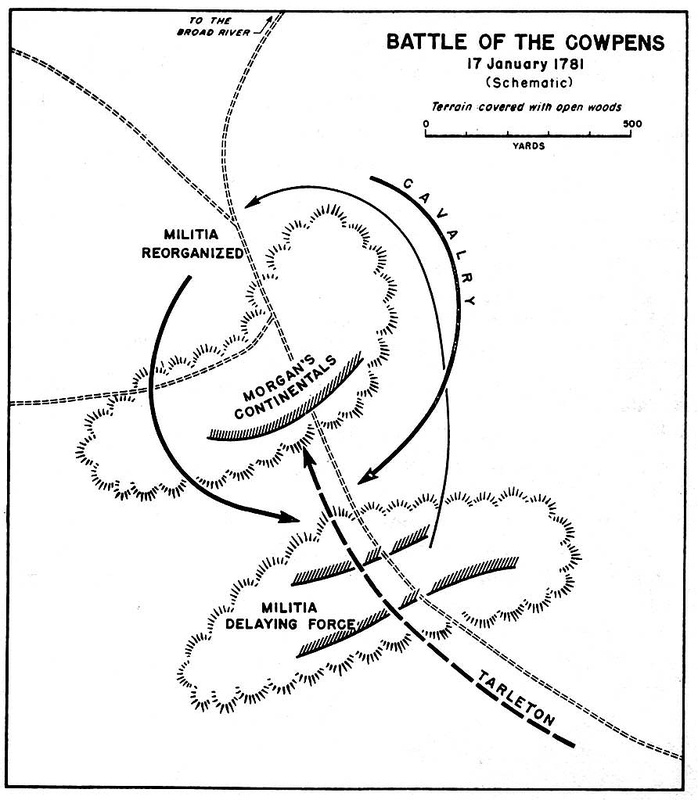 The Battle of Cowpens1, January 17, 1781, took place in the latter part of the Southern Campaign of the American Revolution and of the Revolution itself. It became known as the turning point of the war in the South, part of a chain of events leading to Patriot victory at Yorktown2 The Cowpens victory was one over a crack British regular army3 and brought together strong armies and leaders who made their mark on history. From the Battle of Moore's Creek Bridge4 on, the British had made early and mostly futile efforts in the South, including a failed naval expedition to take Charleston in 1776. Such victories boosted Patriot morale and blunted British efforts, but, by 1779-80, with stalemate in the North, British strategists again looked south. They came south for a number of reasons, primarily to assist Southern Loyalists5 and help them regain control of colonial governments, and then push north, to crush the rebellion6. They estimated that many of the population would rally to the Crown. In 1779-80, British redcoats indeed came South en masse, capturing first, Savannah7 and then Charleston8 and Camden 8A in South Carolina, in the process, defeating and capturing much of the Southern Continental Army9. Such victories gave the British confidence they would soon control the entire South, that Loyalists would flock to their cause. Conquering these population centers, however, gave the British a false sense of victory they didn’t count on so much opposition in the backcountry10. Conflict in the backcountry, to their rear, turned out to be their Achilles’ heel. Into this conflict, General George Washington sent the very capable Nathanael Greene to take command of the Southern army. Against military custom, Greene, just two weeks into his command, split his army, sending General Daniel Morgan southwest of the Catawba River to cut supply lines and hamper British operations in the backcountry, and, in doing so "spirit up the people". General Cornwallis, British commander in the South, countered Greene’s move by sending Lieutenant Colonel Banastre Tarleton to block Morgan’s actions. Tarleton was only twenty-six, but he was an able commander, both feared and hated – hated especially for his victory at the Waxhaws.11 There, Tarleton was said to have continued the fight against remnants of the Continental Army trying to surrender. His refusal, tradition says, of offering no quarter, led to the derisive term "Tarleton’s Quarter". These events set the stage for the Battle of Cowpens. On January 12, 1781, Tarleton's scouts located Morgan’s army at Grindal’s Shoals on the Pacolet River12 in South Carolina’s backcountry and thus began an aggressive pursuit. Tarleton, fretting about heavy rains and flooded rivers, gained ground as his army proceeded toward the flood-swollen Pacolet. As Tarleton grew closer, Morgan retreated north to Burr’s Mill on Thicketty Creek.13 On January 16, with Tarleton reported to have crossed the Pacolet and much closer than expected, Morgan and his army made a hasty retreat, so quickly as to leave their breakfast behind. Soon, he intersected with and traveled west on the Green River Road. Here, with the flood-swollen Broad River14 six miles to his back, Morgan decided to make a stand at the Cowpens, a well-known crossroads and frontier pasturing ground. (About) American Skirmishers, Militia, and Continentals halt British advance. The term "cowpens"15, endemic to such South Carolina pastureland and associated early cattle industry, would be etched in history. The field itself was some 500 yards long and just as wide, a park-like setting dotted with trees, but devoid of undergrowth, having been kept clear by cattle grazing in the spring on native grasses and peavine16. There was forage17 at the Cowpens for horses, and evidence of free-ranging cattle for food. Morgan, too, since he had learned of Tarleton’s pursuit, had spread the word for militia18 units to rendezvous at the Cowpens. Many knew the geography some were Overmountain men who had camped at the Cowpens on their journey to the Battle of Kings Mountain.19 Camp was made in a swale between two small hills, and through the night Andrew Pickens’ militia drifted into camp. Morgan moved among the campfires and offered encouragement; his speeches to militia and Continentals alike were command performances. He spoke emotionally of past battles, talked of the battle plan, and lashed out against the British. His words were especially effective with the militia the "Old Waggoner"20 of French and Indian War days and the hero of Saratoga21, spoke their language. He knew how to motivate them even proposing a competition of bravery between Georgia and Carolina units. By the time he was through, one soldier observed that the army was "in good spirits and very willing to fight". But, as one observed, Morgan hardly slept a wink that night. Dawn at the Cowpens on January 17, 1781, was clear and bitterly cold. Morgan, his scouts bearing news of Tarleton’s approach, moved among his men, shouting, "Boys, get up! Benny's22 coming! Tarleton, playing catch up, and having marched his army since two in the morning, ordered formation on the Green River Road for the attack. His aggressive style was made even now more urgent, since there were rumors of Overmountain men on the way, reminiscent of events at Kings Mountain. Yet he was confident of victory: he reasoned he had Morgan hemmed in by the Broad, and the undulating park-like terrain was ideal for his dragoons23. He thought Morgan must be desperate, indeed, to have stopped at such a place. Perhaps Morgan saw it differently: in some past battles, Patriot militia had fled in face of fearsome bayonet charges – but now the Broad at Morgan’s back could prevent such a retreat. In reality, though, Morgan had no choice – to cross the flood-swollen Broad risked having his army cut down by the feared and fast-traveling Tarleton. Tarleton pressed the attack head on, his line extending across the meadow, his artillery in the middle, and fifty Dragoons on each side. It was as if Morgan knew he would make a frontal assault – it was his style of fighting. To face Tarleton, he organized his troops into three lines. First, out front and hiding behind trees were selected sharpshooters. At the onset of battle they picked off numbers of Tarleton’s Dragoons, traditionally listed as fifteen24, shooting especially at officers, and warding off an attempt to gain initial supremacy. With the Dragoons in retreat, and their initial part completed, the sharpshooters retreated 150 yards or more back to join the second line, the militia commanded by Andrew Pickens. Morgan used the militia well, asking them to get off two volleys and promised their retreat to the third line made up of John Eager Howard's25 Continentals, again close to 150 yards back. Some of the militia indeed got off two volleys as the British neared, but, as they retreated and reached supposed safety behind the Continental line, Tarleton sent his feared Dragoons after them. As the militia dodged behind trees and parried saber slashes with their rifles, William Washington's26 Patriot cavalry thundered onto the field of battle, seemingly, out of nowhere. 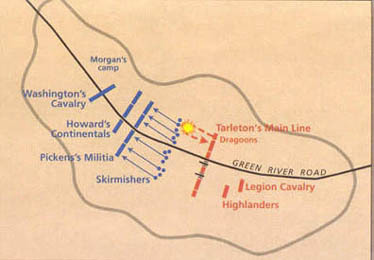 The surprised British Dragoons, already scattered and sensing a rout, were overwhelmed, and according to historian Babits, lost eighteen men in the clash. As they fled the field, infantry on both sides fired volley after volley. The British advanced in a trot, with beating drums, the shrill sounds of fifes, and shouts of halloo. Morgan, in response, cheering his men on, said to give them the Indian halloo back. Riding to the front, he rallied the militia, crying out, "form, form, my brave fellows! Old Morgan was never beaten!" Now Tarleton’s 71st Highlanders27, held in reserve, entered the charge toward the Continental line, the wild wail of bagpipes adding to the noise and confusion. A John Eager Howard order for the right flank to face slightly right to counter a charge from that direction, was, in the noise of battle, misunderstood as a call to retreat. As other companies along the line followed suite, Morgan rode up to ask Howard if he were beaten. As Howard pointed to the unbroken ranks and the orderly retreat and assured him they were not, Morgan spurred his horse on and ordered the retreating units to face about, and then, on order, fire in unison. The firing took a heavy toll on the British, who, by that time had sensed victory and had broken ranks in a wild charge. This event and a fierce Patriot bayonet charge in return broke the British charge and turned the tide of battle. The re-formed militia and cavalry re-entered the battle, leading to double envelopment28 of the British, perfectly timed. British infantry began surrendering en masse. Tarleton and some of his army fought valiantly on; others refused his orders and fled the field. Finally, Tarleton, himself, saw the futility of continued battle, and with a handful of his men, fled from whence he came, down the Green River Road. In one of the most dramatic moments of the battle, William Washington, racing ahead of his cavalry, dueled hand-to-hand with Tarleton and two of his officers. Washington’s life was saved only when his young bugler29 fired his pistol at an Englishman with raised saber. Tarleton and his remaining forces galloped away to Cornwallis’ camp. Stragglers from the battle were overtaken, but Tarleton escaped to tell the awful news to Cornwallis. The battle was over in less than an hour. It was a complete victory for the Patriot force. British losses were staggering: 110 dead, over 200 wounded and 500 captured. Morgan lost only 12 killed and 60 wounded, a count he received from those reporting directly to him. Knowing Cornwallis would come after him, Morgan saw to it that the dead were buried – the legend says in wolf pits -- and headed north with his army. Crossing the Broad at Island Ford30, he proceeded to Gilbert Town31, and, yet burdened as he was by the prisoners, pressed swiftly northeastward toward the Catawba River, and some amount of safety. The prisoners were taken via Salisbury32 on to Winchester, Virginia. Soon Morgan and Greene reunited and conferred, Morgan wanting to seek protection in the mountains and Greene wanting to march north to Virginia for supplies. Greene won the point, gently reminding Morgan that he was in command. Soon after Morgan retired from his duty because of ill health— rheumatism, and recurring bouts of malarial fever. Now it was Greene and his army on the move north. Cornwallis, distressed by the news from Cowpens, and wondering aloud how such an interior force could defeat Tarleton's crack troops, indeed came after him. Now it was a race for the Dan River33 on the Virginia line, Cornwallis having burned his baggage34 and swiftly pursuing Greene. Cornwallis was subsequently delayed by Patriot units stationed at Catawba River35 crossings. Greene won the race, and, in doing so, believed he had Cornwallis where he wanted -- far from urban supply centers and short of food. Returning to Guilford Courthouse36, he fought Cornwallis' army employing with some success, Morgan's tactics at Cowpens. At battle's end, the British were technically the winners as Greene's forces retreated. If it could be called a victory, it was a costly one: Five hundred British lay dead or wounded. When the news of the battle reached London, a member of the House of Commons said, "Another such victory would ruin the British army". Perhaps the army was already ruined, and Greene's strategy of attrition was working. In the Revolution, Patriot and British armies often marched and fought on empty stomachs as plans for obtaining food went awry. This was particularly true in the backcountry where food was scarce. Examples of foraging for food and food-related problems abound. Earlier in the war, General Gates and his Southern Continentals, on the march to Camden, subsisted on apples, peaches, and half-ripened corn. James Collins, writing about backcountry campaigns in his Autobiography of a Revolutionary Soldier, told of eating turnips and parched corn. In one poignant example, Battle of Cowpen's participant John Martin, recuperating from wounds in Mecklenburg County, North Carolina, and beyond assistance of the army, reported the death of his horse because he lacked money to purchase forage. In another instance, Cornwallis, because his army was so dead tired and hungry, chose not to pursue General Greene in the aftermath of the Battle of Guilford Courthouse. Up in Virginia, Samuel McCune was employed to drive cattle from Augusta County to Yorktown. Throughout the southern theater of war, scouting parties on both sides would scour the country in every direction in search of food. The fight itself was fairly brief, and the outcome lopsided--it was "a devil of a whipping," as American leader Daniel Morgan said at the time. Babits provides a richly detailed account of the battle, including an especially good overview of the weapons and tactics used by troops of the time. An archaeologist by training, Babits approaches Cowpens with the familiar meticulousness of his profession; this is an important piece of scholarship on the military history of the American Revolution. Recommended Viewing: Cowpens: The Battle Remembered (DVD). Description: A Tactical Masterpiece of the Revolutionary War. On January 17th, 1781 at the Battle of Cowpens, Brigadier General Daniel Morgan changed the course of the Revolutionary War with his resounding victory over Lt. Colonel “Bloody” Banastre Tarleton’s British redcoats. Cowpens: A Battle Remembered depicts this dramatic conflict through the remembrances of one American militiaman who fought for Morgan. This historic event is commemorated today at Cowpens National Battlefield in South Carolina. In January of the next year, the Battle of Cowpens saw a different strategy but a similar outcome: with brilliant military precision, Continental Regulars, dragoons and Patriot militia executed the war's only successful double envelopment maneuver to defeat the British. Using firsthand accounts and careful analysis of the best classic and modern scholarship on the subject, historian Robert Brown demonstrates how the combination of both battles facilitated the downfall of General Charles Cornwallis and led to the Patriot victory in America. 1 Battle of Cowpens – At the Cowpens, a frontier pastureland, on January 17, 1781, Daniel Morgan led his army of tough Continentals and backwoods militia to a brilliant victory over Banastre Tarleton’s battle-hardened force of British regulars. Located in present-day South Carolina north of Spartanburg. 2 Yorktown - On October 18, 1781, the British under General Lord Cornwallis surrendered to American and French troops under General George Washington at Yorktown, Virginia. 3 British regular army – Regular, trained and uniformed soldiers of the British Army, as distinguished from Loyalist (Tory) militia. 4 Battle of Moore’s Creek Bridge – On February 27, 1777, patriot militia defeated a larger force of Loyalists. The battle was crucial because it ended royal authority in North Carolina and delayed a full-scale British invasion of the South. 5 Southern Loyalists – Those of the southern colonial population remaining loyal to the Crown. Also referred to as Tories. 6 rebellion – The British term for the American Revolution. Those involved were termed "rebels" by the British. 7 Savannah – The British captured this Georgia coastal town on December 29, 1778. 8 Charleston – On May 12, 1780, British forces under Clinton forced the surrender of the Charleston militia and Continentals under the command of General Benjamin Lincoln. The victory was a major setback for American forces in the South. 8A Camden - Fought on August 16, 1780, near Camden, South Carolina, the Battle of Camden was a disastrous defeat for the Patriots. Gates, the American general, gained a reputation as a "fool and coward" for his actions and fleeing the battle site. Reports of the results made Banastre Tarleton a national hero in Britain. 9 Southern Continental Army – Those regular, trained, and uniformed soldiers of the American army stationed in the South, as distinguished from local militia in each colony. 10 backcountry – South Carolina area west of the coastal area, especially west of Camden. Today, referred to as the Upcountry or Upstate. 11 Waxhaws – On May 29, a1780, Tarleton’s Legion overtook and defeated Colonel Abraham Buford and his Third Virginia Continentals as they returned through the Waxhaws area toward North Carolina after the fall of Charleston. (Known also today as Buford’s massacre) There is some contention over the origin of the name Waxhaws. It was the name of Native Americans of the region, derived, some historians, believe, from native language. Others believe it is an English corruption of the original and described not only the Native Americans of the region but also the waxy-looking haw and "hawfields", (shrubs, either Black Haw ( vibernum prunifolium )or hawthorns ( crataegus linnaeus)prominent in the region. The Waxhaw settlement, just off the Great Wagon Road, today covers parts of both Carolinas in an area southeast of Charlotte. 12 Pacolet River – An upstate South Carolina river with its headwaters in North Carolina flowing through present-day Spartanburg and Cherokee Counties before it empties into the Broad. The armies of Daniel Morgan and Banastre Tarleton crossed the flood-swollen Pacolet as they journeyed toward the Cowpens. 13 Thicketty Creek – An upstate South Carolina creek, a tributary of the Broad River. Most likely named for the thick plant growth along its banks. Daniel Morgan and his army camped along Thicketty before their hurried departure for the Cowpens. 14 Broad River – A river beginning in the mountains of North Carolina flowing southeast and joining with the Saluda River at present-day Columbia to form the Congaree River. Morgan, his army, and British prisoners crossed the Broad after the Battle of Cowpens. British General Cornwallis crossed the Broad in pursuit. 15 "cowpens" – A term, endemic to South Carolina, referring to open-range stock grazing operations of the colonial period. These were usually cleared areas, 100 to 400 acres in extent. Many, in eastern South Carolina, were known for their native cane- brakes. Piedmont pastures, though less numerous, often contained peavine. 16 peavine – A native legume found often in piedmont South Carolina cowpens. 17 forage – Food for animals or humans. Also, the search for food for animals or humans. 19 Battle of Kings Mountain – The Overmountain men and other militia defeated British loyalists at Kings Mountain in upstate South Carolina on October 7, 1780. 20 "Old Waggoner" – Affectionate name given to General Morgan who began his military career as a wagon driver in the French and Indian War. 21 Saratoga – In fierce battles on September 19 and October 7, 1777, American forces under General Horatio Gates defeated the British under General John Burgoyne. This victory encouraged France to enter the war to assist the Americans. Saratoga is in upstate New York. 22 "Benny" – Daniel Morgan’s derisive name for Banastre Tarleton. 23 dragoon – A mounted infantryman, who often rode his horse into battle and dismounted to fight. Used synonymously with cavalrymen, both of whom could fight on horseback or dismounted. 24 15 – Dr. Lawrence E. Babits in his book, A Devil of a Whipping: The Battle of Cowpens, believes this figure is wrong and has been perpetuated by writers over the years. 25 John Eager Howard – Native Marylander and Revolutionary War officer who distinguished himself at the Battle of Cowpens. He was subsequently elected governor of Maryland (1788-91), and at one time owned much of the land that was to become Baltimore. 26 William Washington – Patriot Lieutenant Colonel of a cavalry unit, who distinguished himself at Cowpens. He was second cousin, first-removed to George Washington. 27 71st Highlanders – Two battalions of highland Scottish troops raised by England and sent to America in 1775. 71st Highlanders fought at Charleston, Camden, and Cowpens, among other battles. At Cowpens, Tarleton initially kept his Highlanders in reserve, but, as the advance faltered, he ordered them into action against the American right. The Highlanders bore the brunt of the last dramatic events of the Battle. 28 double envelopment – Envelopment is an attack on the enemies flank, rear, and sometimes the front. Double envelopment would entail attack or a surrounding on both flanks, hence all sides. 29 bugler – William Washington’s bugler was very likely African-American. A famous painting by Ranney dipicts him so. Apparently the bugler didn’t file a pension, and Washington didn’t leave behind written papers of his own role or of anyone else’s role in the Revolution. His surname was possibly Ball, Collins, or Collin, but an exact name hasn’t been verified. 30 Island Ford – A normally low-water crossing point on the Broad River, reached by Island Ford Road. When Morgan, his army, and his prisoners crossed on January 17, the water was high from heavy rains and flooding. 31 Gilbert Town – Presently, Rutherfordton, North Carolina. Gilbert Town was a small settlement in 1781 a few miles north of Rutherfordton’s present site. 32 Salisbury – An early town in the North Carolina piedmont known for its Confederate prison and National Cemetery, today, but lesser known for its Revolutionary War prison, most likely established in the latter years of the war. There is no evidence the prisoners from the Battle of Cowpens were imprisoned there. 33 Dan River – A river separating North Carolina and Virginia. 34 baggage – Military supplies such as tents, tools, and rations carried in wagons. Burning the baggage (and wagons) allowed an army to travel faster. 35 Catawba River – River originating in the mountains of North Carolina, flowing eastward, before turning south into South Carolina, where is known as the Wateree, and, further east, the Santee. Morgan crossed the Catawba west of present-day Charlotte, North Carolina. 36 Battle of Guilford Courthouse – On March 15, 1781, a British army under Cornwallis attacked Nathanael Greene’s patriot forces at Guilford Courthouse, North Carolina (part of present-day Greensboro). Although Greene’s forces were forced to retire from the field; the British were badly battered with many men killed or wounded. 37 "Tarleton’s Quarter" - Since it was said that Tarleton gave no quarter (opportunity to surrender) at the Waxhaws, "Tarleton’s Quarter" came to mean no quarter at all. Alden, John Richard. The American Revolution – 1775-1783. New York: Harper and Row, Publishers, 1962. Babits, Lawrence E. A Devil of a Whipping: The Battle of Cowpens. Chapel Hill: The University of North Carolina Press, 1998. _____, Cowpens Battlefield: A Walking Guide. Johnson City, Tennessee: The Overmountain Press, 1993. Baker, Thomas E. Another Such Victory. Eastern National, 1998. Bearss, Edwin C. Battle of Cowpens: A Documented Narrative. Johnson City, Tennessee: The Overmountain Press, 1996. Boatner, Mark M. III. Encyclopedia of the American Revolution. Mechanicsburg, Pennsylvania: Stackpole Books, 1994. Dunbar, Gary S. "Colonial Carolina Cowpens" in Agricultural History. Berkeley, California: The Agricultural History Society, Vol. 35, 1961. Johnson, Curt. Battles of the American Revolution. New York: Bonanza Books, 1984. Lossing, Benson J. The Pictorial Field-Book of the Revolution. Vol. 2. Freeport, New York: Books for Libraries Press, 1969. First Published 1851. Pankake, John S. The Destructive War: The British Campaign in the Carolinas, 1780- 1782. Tuscaloosa, Alabama: The University of Alabama Press, 1985. Raynor, George. Patriots and Tories in Piedmont Carolina. Salisbury, North Carolina: The Salisbury Post, 1990.